Basant Panchmi is the festival of Sikhs and Hindus which is celebrated on the fifth day of Magha. The festival of colors mark the commencement of springs and the end of the winters. The goddess of wisdom, art, culture and music is worshipped on this day. The multicultural and multifaceted country like India celebrates the festival with different names and in different manners. Saraswati puja, shree panchmi, festival of kites etc are all synonymous to Vasant panchmi. It is believed to be an auspicious occasion to tie the knots of marriage as the festival symbolizes love. The day is celebrated with great pomp and show. Feasts are organized and programs of dance and singing are organized. A popular tale associated with the festival narrates the story of kalidas. A not so intelligent man, Kalidas, got married to a young beautiful princess. The marriage could not last for many days as the princess got the knowledge about how foolish her husband was. The disappointed kalidas planned to kill him when goddess saraswati emerged from the waters thereby asking to bathe in the river. Water of the river granted him wisdom to become a great sensational poet later on. The history talks about the celebration of this vasant panchmi in the palace of Kamadeva. People wore new clothier and danced to the beats of the Dhol to exhibit their happiness. Love forming an integral part of the festival has always included singing of romantic songs. How is it celebrated in different parts? The day honors the personifications of spring, Kamadeva and Vasant. Also the day is predominantly celebrated by worshipping goddess saraswati, who symbolizes art, wisdom, knowledge, music etc. The devotees offer sacred food items in the temples of saraswati a night before the festival with the hope that goddess would join them in the celebration the next morning. The feast majorly contain food items with a yellowish-golden tinge as yellow color is exceptionally significant in the celebration. The color is associated with the blossoming mustards which can easily be spotted in Punjab and Haryana during this span. The sky gets veiled under the colorful kites as flying kites is a traditional custom of the festival that has been practiced since ever. Owing this tradition, vasant panchmi is also celebrated as the kite festival in cities like Firozpur. Since yellow color holds immense significance in the celebration, people wear yellow colored dresses and prepare bright colored food items like Boondi laddo and meethe chawal. As already mentioned, goddess saraswati is known as the symbol of wisdom and knowledge. Hence the educational institutions does not lag behind in celebrating the day. The idols of saraswati are wrapped in yellow saree and adorned with glittering jewellery. Goddess is worshipped and pleased by organizing musical events and offering prayers. The auspicious occasions is believed to be the most appropriate time to have new beginnings. Children were taught to write the first word on this day with the hope that goddess saraswati would shower her blessings. 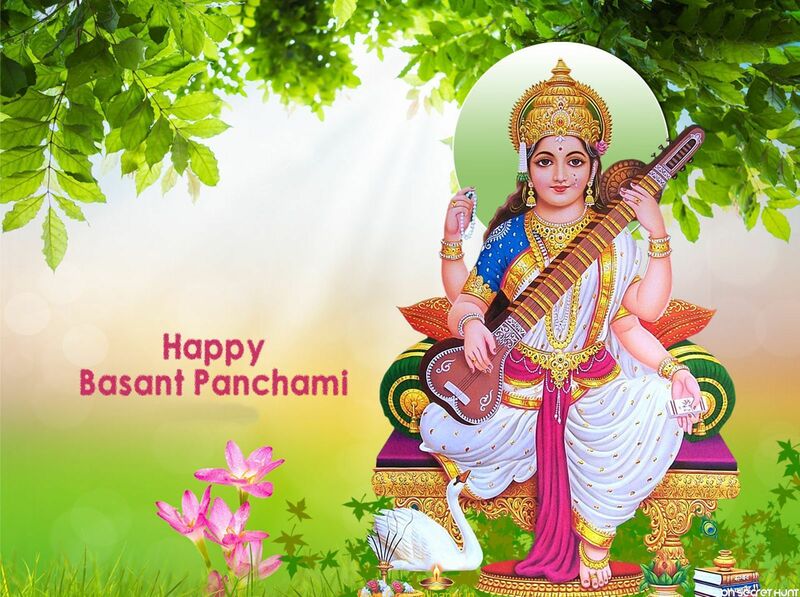 In states like west Bengal, grand pandaal are set up to welcome Saraswati on Sri Panchmi, another name for vasant panchmi. The idols are carried to river Ganga with utmost respect and honors, which is later immersed in the waters as per the custom. Nepal is one of those countries where the followers celebrate the festival with the same devotion. People gets engaged in the work of decorating the temples of saraswati and in preparing delicacies to offer the goddess of wisdom. Another interesting folk lore tells about the feeding of snakes with milk to bring wealth and success to the house and family. The offerings also differ from region to region. For example, in Bengal, Goddess is offered Boondi ke laddo and sweet rice while the dwellers of Bihar offer malpua and kheer. The residents of uttar Pradesh are the followers of lord Krishna and hence offer prayers and sweet dishes like kesari bhat to the deities of lord Krishna. Decades old tradition demands a log with the figure of Holika to be placed in any public area on vasant panchmi. For the next 40 days, all the passersby comprising of the devotees add twigs and flammable material to it which it lit on the occasion of holi. The celebration is in the honor of goddess saraswati who bestowed the most precious treasure; wisdom and knowledge. She is the symbol of intellect and learning. The four hands of the goddess, as evident from her idols, stands for ego, intellect, mind and alertness. These are considered to be the four facades of human personality. The mythology says that goddess saraswati was born on this day hence her birthday is celebrated by worshiping her. Prayers are chanted and food is offered to please her. People wish to attain the treasure of wisdom from the goddess. The day has a great significance as it marks the end of the blue winters and initiation of the colorful and beautiful springs. Yellow dominates the festival entirely as it symbolizes the blossoming of the flowers, ripening of fruits and blooming of the mustards. The beautiful stretches of the mustard field in the regions of north India are awe-strucking. Yellow is also the color of springs (basant) and is believed to impart a sense of positivity, energy, enthusiasm, prosperity, light and optimism. People preferably make yellow colored clothes for this day. Yellow flowers and mouth watering dishes are offered to goddess saraswati which are yellow in color. Putting a yellow turmeric tilak on the forehead is one of the rituals performed on this day. The spring festivals bring joy and happiness in the homes of the devotees every year. Since it is a public holiday, all the offices and educational institutions remain closed. Vasant panchmi bring together the varied culture of the country that shelters innumerable customs, languages, traditions and thinking.